Lloyds Banking Group’s past is delaying its promise of a sunnier future. The lender brought forward its annual results on Feb. 3, including the shock revelation of another 1.8 billion pounds of legal reserves to cover the mis-selling of payment protection insurance (PPI). The past weighs heavily on Lloyds, but its premium to peers still looks intact. Would-be investors need a long lens. Lloyds says claims for PPI redress, which have eaten up 7 billion of a total 9.8 billion pounds in provisions, are tailing off slower than expected. When Lloyds resumes dividends – suspended since 2008 – they will be modest. The board’s “medium-term” aspiration for a 50 percent payout ratio is at least two years away. Set against that is the improvement in the bank’s underlying business and balance sheet. Loan growth was 3 percent last year and the net interest income margin stayed above 2 percent in the fourth quarter. Despite the hefty PPI charges, the bank’s Basel III Tier 1 capital ratio even improved 40 basis points to a respectable 10.3 percent. In turn, that strength has allowed Chief Executive Antonio Horta-Osorio to throw sops to the UK government, which still owns 33 percent. Lloyds has pledged to hike loans to small- and medium-sized enterprises by 1 billion pounds this year, to lend to 80,000 first-time home buyers and donate 100 million pounds to charity. Still, there is enough awkward news in the results to cast a cloud over the next stage of the government’s privatisation of its Lloyds shares. After selling the first chunk above the government’s 74 pence in-price, Lloyds will be expected to follow suit. Its shares were trading at 81 pence in the wake of the results. Retail investors, who will form the bulk of the next offering, will expect a discount – especially as smaller dividend payouts won’t help it sell. Longer-term, Lloyds is still the sector’s hot property. Its capital position is stronger than either Barclays’ or Royal Bank of Scotland’s and it has no risky investment bank. Lloyds’ government-arranged marriage with HBOS has given a commanding market share. That’s why Lloyds trades at 1.4 times its book value, versus discounts for its rivals, and the advantages look more durable than the PPI scandal. 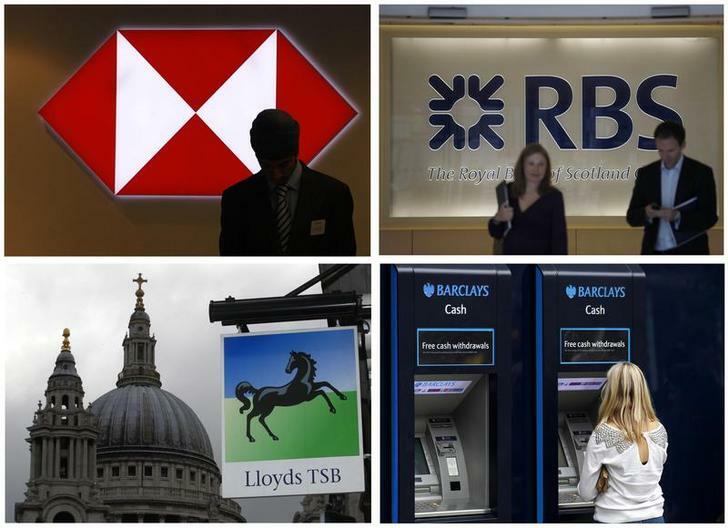 A combination of four photographs shows (top L-R) a worker silhouetted against an illuminated sign in a branch of HSBC; Two people walking out of the headquarters of the Royal Bank of Scotland; (bottom L-R) a Lloyds bank branch near St Paul's Cathedral and a customer using a Barclays ATM, in central London. Lloyds Banking Group on Feb. 3 released details of its fourth-quarter and full-year results 10 days earlier than expected, including an additional 1.8 billion pounds in reserves for possible litigation tied to mis-sold payment protection insurance (PPI). The UK lender said it had made a small statutory pretax profit in 2013, and that it would report underlying full-year profit of 6.2 billion pounds, with a net interest margin of 2.1 percent. Shares in Lloyds were trading 2.5 percent lower by 0945 GMT, as the broader FTSE100 index was flat.